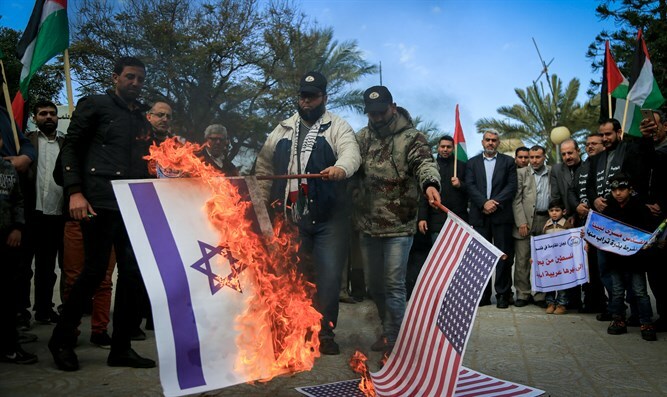 A watchdog organization monitoring anti-Israel incitement in the Palestinian Authority has recorded a significant uptick in PA propaganda encouraging violence against Israeli Jews following President Donald Trump's recognition of Jerusalem as the capital of Israel last month. According to Palestinian Media Watch (PMW), during a special broadcast immediately after Trump's recognition, official PA TV aired songs encouraging violence against Israelis. One song is a tribute to "my weapon," which "no force" can remove. "There is no force in the world that can remove the weapon from my hand. From my wounds, my weapon has emerged. Oh, our revolution, my weapon has emerged. There is no force in the world that can remove the weapon from my hand. This revolutionary people has sacrificed and offered in order to live in freedom! My weapon has emerged. My weapon has emerged..."
I'm coming with my rifle and my faith." My weapon has emerged. My weapon has emerged." Our war is a war of the streets. I swear, you won't escape, my enemy, from the revolution and the people. How will you escape the ring of fire while the crowds are blocking the way? I'm coming towards you, my enemy, from every house, neighborhood and street."